With Kutná Hora or Karlovy Vary, Olomouc is amongst the destinations that you should not miss while visiting the Czech Republic. The historical centre of the Moravian capital offers a great snapshot of the history and architecture that this city has to offer. Walk around the centre and discover monuments such as the Holy Trinity Column, which was built in 1740 and is now part of UNESCO’s world heritage list. From Prague, you find frequent connections to Olomouc. You may decide to go either by bus or by train, even though the second option offers more frequent connections but is also much quicker. This train journey make take you slightly more than 2 hours, while a bus ride will definitely take you more than 3 hours. The 3 Czech train operators (Ceske Drahy, Leo Express and Regiojet) all offer regular connections to Olomouc. RegioJet is currently the operator offering the best value for money on this destination. To get more information on your journey, have a look at our article on trains in the Czech Republic. Olomouc central station is located east of the centre, and a short 10-minute tram ride will take you right next to the historical centre. Even though Olomouc is one of the largest city in the country with more than 100,000 inhabitants, visitors always enjoy the fact that the majority of touristic sites and places of interest are located close to the old town square. Thus, you may just walk around Horní náměstí (main square) and Dolní náměstí (lower square) and will still be able to enjoy most of Olomouc’s treasures. On Horní náměstí, after a visit of the Town Hall (one of the best examples of Olomouc great architecture) you may want to stop and contemplate the famous Holy Trinity Column, a 32-metre-high piece of architecture where you sill see 18 statues of saints. On the same square, don’t miss the astronomical clock, which was once as famous as Prague’s. When getting to Dolní náměstí, slightly less busy than the main square, you will see the impressive baroque fountains of Neptune and Jupiter. 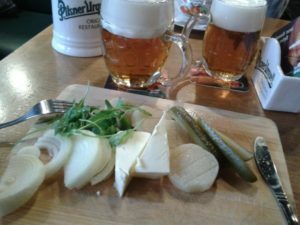 If you feel like trying the local cuisine, the lower square offers numerous restaurants where you may be tempted to try Olomouc’s traditional cheese, the delicious Olomoucké tvarůžky. Despite its rather strong taste, it is definitely worth it, especially you’re a cheese fan! This entry was posted in Uncategorized and tagged Dolní náměstí, Holy Trinity Column, Horní náměstí, Moravia, old town, Olomouc, square, train, UNESCO, visit on January 22, 2014 by Nicolas. From Prague, travelling to secondary cities and visiting the Czech Republic is quite easy. And even though travelling by bus is one of the most popular means of transport, train travel remains the most comfortable option and is quite often cheap. If you’re planning on catching a train, you will travel with one of the 3 companies currently operated in the coutry : České dráhy (on a regular train or Pendolino, the local fast train), Leo Express or RegioJet. This last one is a subsidiary of Student Agency that offers bus and train connections in the Czech Republic but also offers travel agency services. The national railway operator offers the best connections and has the most developed network in the country. It is still today the first operator in terms of passengers, as the market was liberalized only recently. Though, even if the comfort aboard trains and the prices of tickets are reasonably good, České dráhy offers a lower quality of service and more expensive tickets than its competitors. Thus, you would probably only consider this option if you’re going to small cities that are not serviced by the other two train operators. With its first commercial journey at the end of 2012, this train operator has only recently entered the market. Leo Express offers great comfort and is probably the operaor that offers the best seat in “Premium” class, which is the equivalent of their 1st class. Its network remains very limited as they only offer train travel to slightly more than 10 destinations in the country. – Economy, their lowest class, where you still get a wi-fi internet connection! – Business (half way between 1st and 2nd class): you will benefit from a number of services such as a free wi-fi connection, free snacks and beverages. – Premium, equivalent to a premium first class, where you will benefit from all Business class services, larger space with a comfortable seat allowing you to be in a sleeping position. Moreover, you will be offered a free meal as well as free drinks. Founded in 2009, Regiojet stands out thanks to its prices and the value for money it offers to its clients. Even though launched only 4 years ago, they already offer a relatively dense network that covers most of Czech Republic’s main cities. – Standard, equivalent to a regular second or economy class. You travel in a 6-seat compartment and benefit from free wi-fi as well as free beverages. There, you travel in a regular “open space” car. Even though the seat design is not as advanced as in other countries in Europe such as France and their fast trains (TGV), you will enjoy the same quality of comfort. As in Standard class, you will be offered free hot and cold beverages, and the prices for meals and snacks are extremely cheap. – Business, where you get more space than in Relax class, and share you compartment with 3 other people. The seat and services provided are comparable to those in Relax class, the only difference being the space between seats. Furthermore, you have more privacy as you travel in a 4-seat compartment. The two new companies that recently entered the market have innovated a lot and have improved train travel standards. Travellers have definitely benefited from their entry on the market, both financially and in terms of comfort! Thus, if you’re planning on catching a train in the Czech Republic soon, we would definitely advise you to go for one of these two companies, RegioJet probably being slightly better than Leo Express. This entry was posted in By train, GETTING AROUND, HOW TO GET THERE?, Public transport and tagged class, comfort, czech republic, prague, price, seat, service, standard, train, travel on January 13, 2014 by Nicolas. I have to admit, Czech cuisine is not as renowned as French, Spanish, Italian or some Asian cuisine, but here in Prague, we very often keep a tradition of serving home made and fresh food. Indeed in every hospoda (local pub, restaurant), you’ll almost never get pre-cooked meal that were just warmed up – it’s almost always home made dishes. And when trying local food (which in fact is often considered local to Central Europe and not only Czech Republic) you’ll have the opportunity to try some classics. As a starter, you’ll notice that Czech people very often have a soup, even in hot summer months. Lunch menus which are offered in local restaurants and often called “poledni menu” are traditionally menus including a main dish and a soup. The variety of soups is endless : chicken/ beef consommé with noodles, mushroom cream soup, spinash cream soup or gulášova (soup derived from the famous guláš) are amongst the most common ones. Don’t miss the Plzeňský guláš! As a main dish, make sure you get to try a real classic : a beer guláš (with Pilsner beer in that particular case). You may argue that guláš is originally Hungarian, but as mentionned earlier on, we may consider that this dish is local to the whole region. This dish may sometimes be served with bits of spicy red pepper, so make sure you tell the waiter if you’re not a fan of spicy food! If you had to compare this dish to another renowned international dish, it would be to a « bœuf bourguignon » in France or an Irish stew in Ireland. In typical Czech restaurants you’ll also have the opportunity to try the chicken or pork schnitzels, called Smažený kuřecí řízek for chicken and Smažené vepřové řízek for pork, which are very similar to the famous Wiener Schnitzel. Still, if you want to try something typical from Czech Republic and that you rarely find in other countries of the region, have a try at the Smažený sýr (fried cheese) or commonly called smažák which is often served with potatoes. It’s generally made of eidam cheese (similar to a French camembert) or blue cheese. As far as street food is concerned, the klobása (Czech sausage) is a real classic. It is usually served on a small paper plate, a piece of local bread (Šumava) and local mustard. You may also try smoked ham which is pretty common in the country. Czech Republic may not have a lot of internationally renowned desserts, but amongst the classics, you may still want to try the medovnik which is a cake made with honey – dessert which is also popular in Russia and former soviet republics. You may also want to try the trdelník, a pastry made of flour which is rolled and generally covered with sugar and nuts. In touristic districts, you’ll find a lot of small shops selling these trdelník and for instance on Malostranské náměstí square or on the old town square you’ll find several ones. This entry was posted in Local Czech restaurants, breweries, RESTAURANTS AND CAFES, SOME USEFUL INFORMATION and tagged cuisine, czech, dessert, dinner, dish, food, lunch, menu, poledni on December 13, 2013 by Nicolas.